15mm.co.uk: Sengoku 15mm Japanese Fantasy third wave singles and packs released! Sengoku 15mm Japanese Fantasy third wave singles and packs released! The Sengoku range of 15mm scale Japanese Fantasy sculpted by John Bell is the largest such range in the world! It now has sixty plus single codes and packs as well as three complete sets and two HOTT 2nd Edition 24AP Armies supplied with all needed element bases. Great for Japan themed games or spicing up your 15mm fantasy or pulp or post-apocalyptic collections among many others. As well as Male and Female warriors there are Male and Female Buddhist monks. There are Goblins and Kappa was well as Tengu and Oni. Sengoku has Ghosts, Snakes and Monsters plus centipede, snake and spider bodied warriors and monsters. School Girls in Japanese uniforms and now Goblin Cavalry, Plant Sprits, Ghosts and Tanuki. Go HERE for the range page where all the miniatures are. We are proud to announce the release of the third wave of Sengoku miniatures. Here is a list of the new codes, singles, packs and set. Go HERE. 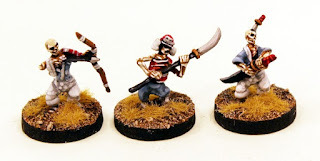 Twenty Three Japanese 15mm Fantasy Miniatures - The Full Sengoku III Set! 23 white metal miniatures designed by John Bell suitable for use in any oriental themed 15mm scale game system or army. This is a set containing one of every pose in the second set of the range SGF41,42,43,44,45,46,47,48,49,50A,50B,51A,51B,52A,52B,53A,53B,54,55,56,57,58 and SGF59. Assembly required. The pack offers a small saving off single purchases of those codes. Get one of everything! This pack contains four riders and four mounts taken from SGF50B, SGF51B, SGF52B, SGF53B and the pack offers a small saving off single purchase of these codes. 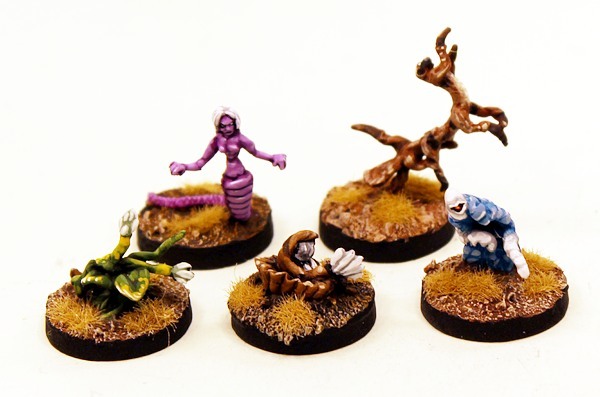 This pack contains twelve miniatures randomly taken from but including all of SGF41, SGF42, SGF43, SGF44, SGF45, SGF46 and SGF48 plus the pack offers a small saving off single purchase of these codes. This pack contains eight miniatures randomly taken from but including all of SGF47, SFG49, SGF57, SGF58 and SGF59 plus the pack offers a small saving off single purchase of these codes. Wow! This range is expanding nicely! The answer is tucked away in their baggy hakama. SHM88 Bestial Cyclops and more released!